If we can visualize in that beautiful setting the Home finished and being the nucleus from which cottages may be erected for aged couples who are able and wish to maintain their own home, and following that, with the complete support of the clubs, organizations and the public in general, a Nursing Home for the aged and infirm is a possibility. Mistakes of communities have been the lack of preparation for the future. Let us have a vision – a vision of ten, twenty, thirty or fifty years hence. Let us work for the present on a plan for the future. Their dream was realized with the building of the original Glacier View Home (subsequently called Marsland House) which was home to 28 elderly Comox Valley pioneers. 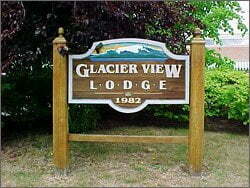 Glacier View Lodge Society was incorporated in 1979. In 1982, the Society opened a new 75-bed intermediate care facility on adjacent property, and the original Home was closed. The new Lodge was designed with all private rooms and ensuites because the Board of Directors at the time insisted on privacy and comfort for our senior citizens. The facility also housed an Adult Day Program for seniors who were still living at home in the community. In 1991, a 27-bed Special Care Unit addition was opened with the express purpose of caring for the special needs of those residents with dementia. 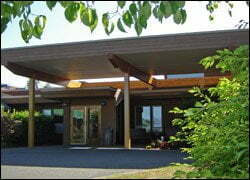 Over the years, Glacier View Lodge has evolved into the complex care facility it is today. Areas of the building have been upgraded and redecorated; overhead lifts have been installed; new fire detection and resident wandering systems installed, computerization has been implemented, and staff complement adjusted to care for residents with complex health needs. Glacier View Lodge currently employs nearly 200 people. The Lodge is governed by the Society’s Board of Directors who contract selected administrative services from St. Joseph’s General Hospital.